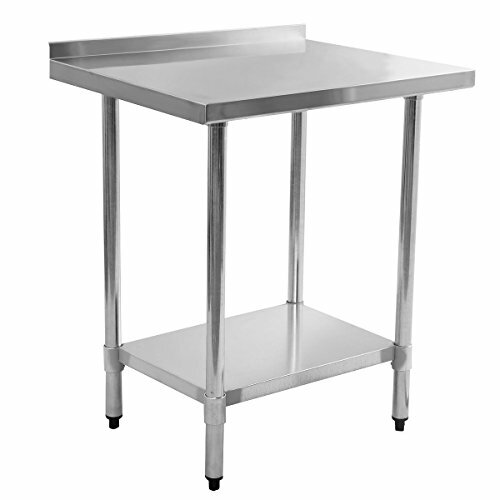 『Stainless Steel Table with Protective Film & Backsplash』 - This kitchen work table is made of high-quality and durable stainless steel which makes it perfectly suitable for kitchen use. The tabletop is protected with a layer of film to prevent the table from being scratched during transport. The backsplash on the edge kindly protects stuff falling. 『Easy to Assemble and Maintain Clean』- The table comes with a detailed manual and complete accessories. It will be easy for you to assemble it well in short time. Featuring sleek and flat surface, the work table is also easy to be cleaned with water. 『Protective Plastic Leg Support』- Plastic support under four legs protect ground from being scratched and add more height to the leg. 『Bottom Extra Shelf』- Table top provides much more space for you to finish your kitchen work. The bottom shelf also offers ample room for you to store your food or kitchenware. 『Round-Edge & Easy to Move』- Each corner are round processed to protect your hands while working. Although it is made of stainless steel, it is also convenient for you to move it in your kitchen.